Trying to make Gluten Free Cooking eaiser and tastier. In glass mixing bowl soften butter in microwave for about 40 seconds, add cream cheese to bowl and return to microwave for another 30 – 40 seconds. Cream together and add water, beaten eggs, and vanilla. In another bowl whisk together all dry ingredients (except ¼ cup sugar) and pour into the bowl with all of the liquids. Stirring and folding until there is no dry flour left. Cover and place in refrigerator for at least 20 minutes. Preheat oven to 375* F.
Grease and flour a 9 to 10 inch baking dish (I like to use additive free powdered sugar for this). 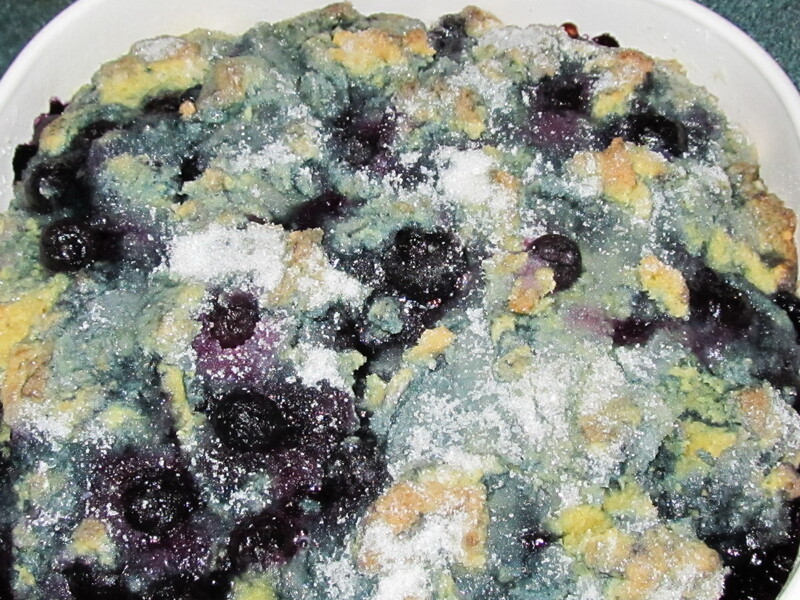 Remove batter from refrigerator and add frozen blueberries. Gently fold berries into batter, trying not to crush berries. Pour batter and berries into baking dish, sprinkle the ¼ cup of sugar on top and bake for 40 – 45 minutes or until crispy on top and set in the center. Let cool and serve. This is good for a dessert or for breakfast. Please note: In my opinion this is not a bread flour. I tried it in bread, cookies and pizza dough. It is a dense flour and I still prefer Tom Sawyer G F and Betty Crocker GF. That’s just me, yall may have a better experience with it than I did.